The television adaptation of Christos Tsiolkas’ 2008 novel The Slap is about to screen on ABC 1 and while it is a best-selling book in Australia and beyond, many of the television viewers will be encountering the story for the first time. The Slap is an explicit novel – explicit in its treatment of nearly every bodily function and relationship dysfunction you can think of, or prefer not to think of. Oh, and did I mention the abundant use of legal and illicit drugs? But that’s not his style and if you’re not sure if it’s your’s, check out a review of the book I wrote some time ago – it might give you some more insight, or a little more to offer around the water cooler tomorrow. 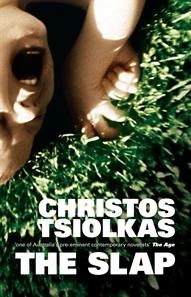 Posted in Australia, Books, Comment, Culture, MediaMoments, News.Tagged ABC, Christos Tsiolkas, television, The Slap.